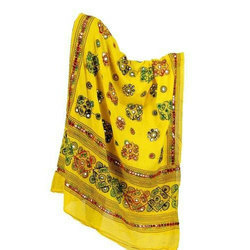 Our product range includes a wide range of aari work dupatta / full embroidered cotton dupatta / banjara dupatta, cotton gujarati gamthi dupatta, gujarati patchwork gamthi dupatta - banjara chunni, multi color dupatta - rainbow chanderi silk dupatta - punjabi chunni, indian kantha embroidered dupatta and indian chanderi silk dupatta - silk dupatta - indian dupatta - silk dupatta. 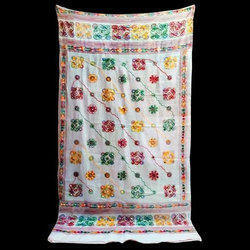 Gujarati Aari embroidered Dupatta - Embroidered and Synthetic mirror work dupatta. Indian Traditional Hand Crafted Cotton Dupatta With Real Mirror Work , Gamthi Embroidery . Varieties of silk, cotton, brocade fabrics patches used to create this Dupatta. 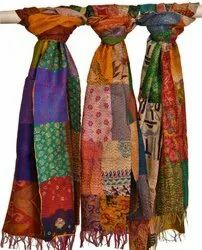 All pieces of fabrics are stitched together before block printing and Kantha work on it, which gives the look of GUDRI. This Reversible Dupattas has the two layers of fabrics so it can be worn from both side which has distinctive prints, style and fabrics. Hand Kantha work and use of handloom fabrics provide an ethnic touch to this Duapatta. Please note, fabrics patches are joined unevenly and all are different from each other. There might be lack of perfection in stitching, embroidery, printed as this piece being crafted by hands. 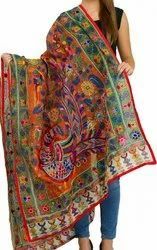 With an objective to fulfill the ever-evolving demands of our clients, we are engaged in offering a wide assortment of Cotton Embroidered Dupatta. 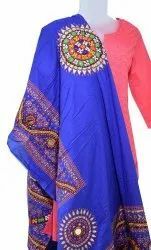 Being a leader in the industry, we are engaged in offering a qualitative range of Ladies Embroidered Dupatta to our customers. PLEASE NOTE : Color Shades may lighter or darker from the shown images.